To search the minute books you will need to use the Māori Land Court Minute Book Index. This index was created in the 1990s by librarians at the University of Auckland. The index covers 1,100 minute books from the whole country for hearings held between 1865-1910. The index is available via two platforms. Either through Knowledge Basket, which Auckland Libraries members can access online, or through DBTextworks. Auckland Libraries members can search the DBTextworks version on computers at the Central Auckland Research Centre, the South Auckland Research Centre and the West Auckland Research Centre. We recommend using the DBTextworks version if possible as it enables specific field searching, the results can be easier to interpret and you can utilise the 'browse feature' to look up terms used in the index (helpful if you are unsure of spellings etc.). During August 1901 Aucklanders were being terrorised by a ghost. It haunted the central Auckland areas of Grafton, Eden Terrace, Newton and Western Park. The apparent apparition was heavily reported on in the newspapers and the cartoonists of the day all had a take on it as well. Even an advertising copywriter got in on the fun. 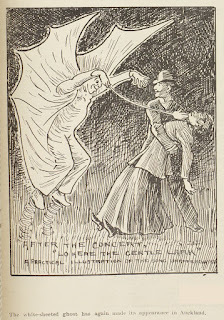 Ref: New Zealand Graphic, The white-sheeted ghost has again made its appearance in Auckland, 24 August 1901, Sir George Grey Special Collections, Auckland Libraries, NZG-19010824-367-2. When was the last time you looked in the New Zealand Gazettes as part of researching your family history? 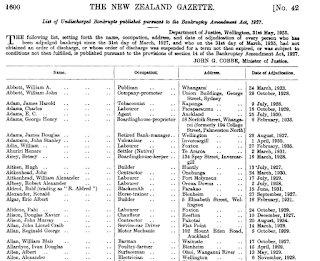 After some years of having LexisNexis New Zealand Gazette Archives accessible on one of our family history computers we now have it available on all five. Of course we still hold the hard copies but doing a database search (when you don't know what issue you are looking for) is so much easier. The gazette archives consist of the New Zealand Gazette, the New Ulster and New Munster Gazettes, and the provincial gazettes for Auckland, Hawke's Bay, Taranaki, Wellington, Marlborough, Canterbury, Westland, Otago and Southland. The indexes are updated yearly, running from 1841 to present day. That is a lot of coverage for events ranging from finding a bankruptcy notice for an errant relation or your grandfather's school certificate results. 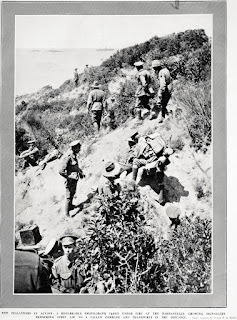 This photograph from the Auckland Weekly News Supplement (AWNS) depicts first aid being applied to an ANZAC soldier on the sloping terrain of Gaba Tepe on the Gallipoli Peninsula on 25 April, 1915. Published on 24 June 1915, one hundred years ago today, it is considered the first newspaper image of the Gallipoli campaign and is attributed to Private Robert Blackwood Steele of the Auckland Infantry Battalion. Ref: R.B. Steele for the Auckland Weekly News, New Zealanders in action, 24 June 1915, Sir George Grey Special Collections, Auckland Libraries, AWNS-19150624-35-1. At least nine of Auckland Libraries’ past or present community libraries are either war memorial buildings or have war memorial associations. The oldest of these is the Albany Memorial Library.On Peace Day 19 July 1919 a group of Albany residents resolved to build a library as their district’s war memorial. Architect Sholto Smith designed the building. Governor-General Lord Jellicoe opened the cottage-style, half-timbered structure on 21 December 1922. The building functioned as a working library until 2004, and is still available for community use today. In 1950s Auckland, a group of concerned citizens decided a periodical to keep tabs on the city leadership was needed. Thus was born Comment, published by Hobson Publications. The editorial board included managing editor Charles Fisher but besides Comment itself, the only other publication from the company appears to be a Hamilton yearbook published in 1955. 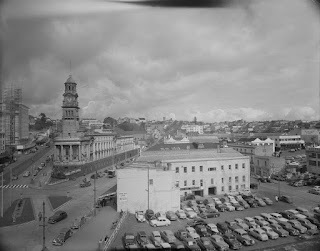 Ref: Auckland City Council, Looking from the roof of a building in..., 1956-57, Sir George Grey Special Collections, Auckland Libraries, 580-2272. 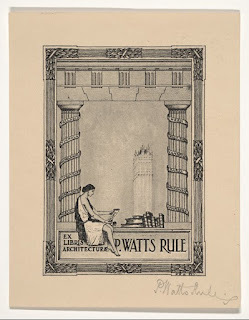 Did you know that June the 9th is International Archives Day? To celebrate, archive services from around the world were invited to submit an image from their collections and send a message to archival colleagues around the world. See if you can find all the contributions from New Zealand in the photo page, according to the NZ Records email list there are nine. Information about the gestation of International Archives Day and the reasoning behind it can be found at the International Council on Archives website. 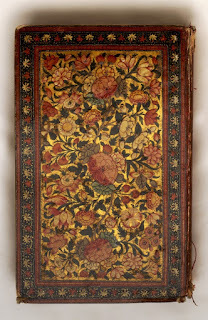 The hashtag #IAD15 was also really enjoyable to follow on Twitter throughout the day; happily Britain’s National Archives have collated them in Storify form. All of Auckland Libraries’ Research Centres hold archival collections, as does the Birkenhead Library which is home to the Chelsea Sugar Refinery’s archive. 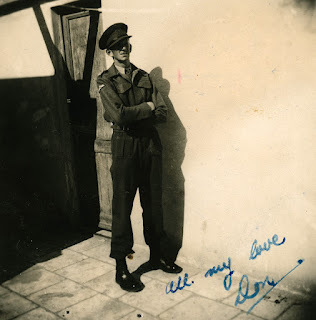 Through sheer coincidence the subject of both of Auckland Libraries’ contributions were the personal papers of decorated war heroes. Looking through the Footprints database I was surprised how many images depicting official openings of bridges there were in South Auckland. In the good old days, and even in the not so early days these ceremonies were major events on the social calendar. Everyone turned up wearing their Sunday best. 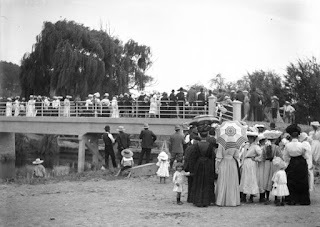 Ref: David Bryan, Opening ceremony, Clevedon wharf bridge, 1908, photograph reproduced courtesy of Clevedon and District Historical Society, South Auckland Research Centre, Auckland Libraries, Footprints 02585. Back in the day, Auckland had its only version of New York’s Coney Island - a fully functioning amusement park on the waterfront complete with dodgems, a roller coaster, stalls and sideshows. The equipment had come from the New Zealand and South Seas Exhibition, a world fair that ran in Dunedin from 1925-1926. Held at Logan Park, it was most spectacular in the evening when lights highlighted the growing use of electricity. 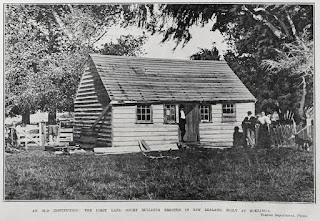 According to Te Ara, it was the most popular exhibition in New Zealand’s history. Note the "scenic railway" to the right in the image below. There is an interesting and rather beautiful little hall in Union Road, Mauku (a semi-rural locality between Waiuku and Pukekohe). Known as the Mauku Victory Hall, this was formallyopened by Governor-General Viscount Jellicoe on 7 June 1922. Ref: Bruce Ringer, Mauku Victory Hall, August 2014.